Liverpool manager Jürgen Klopp aires his frustration after Liverpool were wrongly denied an opening goal from Sadio Mane. Liverpool manager Jürgen Klopp believes his Liverpool side suffered an injustice at the Emirates Stadium on Saturday after Sadio Mane was wrongly denied a goal as the Reds suffered an evening of frustration against Arsenal. The Merseysiders were held to a 1-1 stalemate after James Milner's opener one minute off the hour mark was cancelled out by Alexandre Lacazette's late strike eight minutes from time. A draw was enough to move Liverpool to the summit of the Premier League table - although were then moved from top spot by Manchester City who beat Southampton comfortably. However, it was a night of what could have been had Mane's first-half effort not been incorrectly ruled offside, despite the replay's showing Liverpool's No.10 was clearly behind Roberto Firmino before tapping home the rebound after the Brazilians effort hit the post. “I think it was a goal,” said Klopp. “It should have been one, that's how it is. I've said it already 20 times. “When I was a player the offside rule was different. If somebody was in the area where the ball went in [it was offside], now it is different. We all know that. The German manager then added: “It was a brilliant attack, that's what you do on the training ground, you keep one player between the centre-halves slightly offside and another player takes the ball. "It wasn't any less spectacular than last year, it just had less goals"
Despite two potentially dropped points, the result ensured Liverpool moved their points tally to 27 points from their opening 11 games - their highest total since 2002/03. A draw also meant Klopp still hasn't tasted victory against Arsenal manager Unai Emery, who famously beat the Reds manager when his Sevilla side beat Liverpool 3-1 in the 2016 Europa League final. 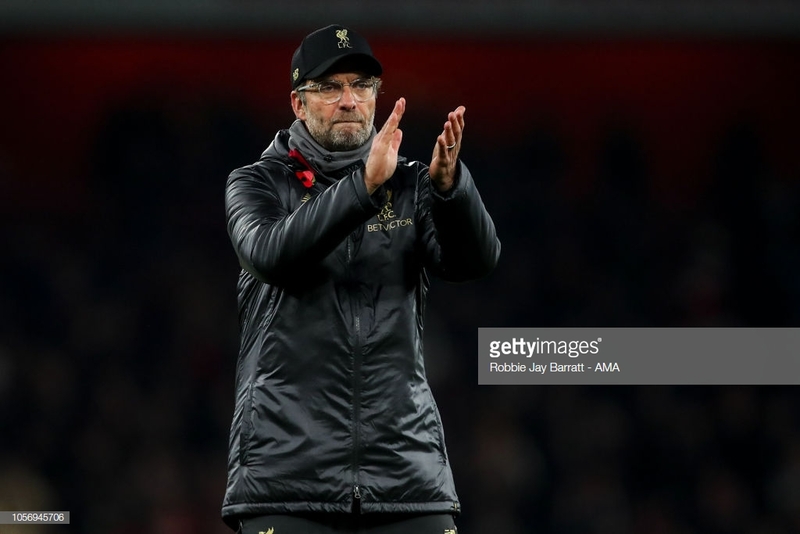 Liverpool keep their four-point distance over Arsenal who sit in fifth and Klopp isn't at all surprised by how tight proceedings at the top are becoming. “I'm not surprised by how close the league is, to be honest,” said the Liverpool manager. “It was always difficult against Arsenal. “I'm not sure if the game last year was better [from us] simply because we scored more goals and used our chances. “It wasn't any less spectacular this time, it just had less goals. “If we do a bit better in the first half it would have been even more difficult for Arsenal.